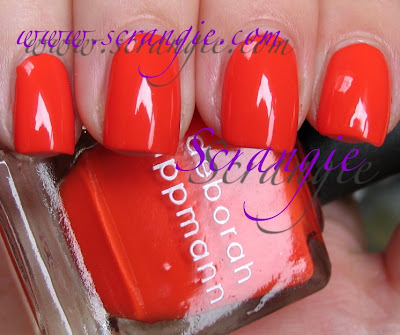 This Deborah Lippmann collection surprised me. At first glance, only the blue (I Know What Boys Like) caught my eye and the rest looked nice but nothing special. When I saw them in person, I knew I was totally wrong. They are all special. Girls Just Want To Have Fun. This is a light, bright pink-toned coral pseudo-jelly. I say pseudo-jelly because it's too opaque to be a true jelly but somehow is still has that squishy jelly-finish look. My skintone makes this pull a little more orange than it looks in the bottle- it seems more pink toned until I put it on. This is really fresh and pretty looking and I love the squishy candy-like look of it. I Know What Boys Like. 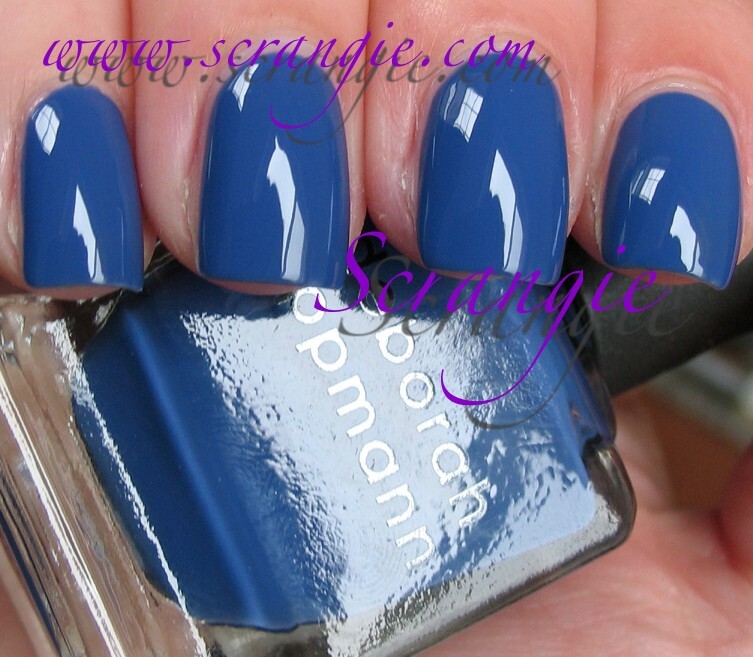 This is just an amazing color, I can't even tell you. It's the most fascinating shape-shifting sort of color... In some lights it looks like a dusty deep periwinkle blue, but in other lights it has a distinct purple tone to it. It has a softness, a sort of dusty/muted look that makes it not so bright and in your face as expected, but it's such an unusual shade that it's still an attention grabber. Lara's Theme. This is an orange creme. It's a medium saturated orange with some warm yellow tones to it, and it's bright but not neon. It looks a little darker on the nail than it does in the bottle. This is the one that really blew me away. I like orange polish to begin with so I knew I was going to like this, but I wasn't expecting it to be this good. For one, it's the perfect year-round orange- it's not obnoxiously neon or too Halloweeny (as much as I love neons and Halloween) so it doesn't seem limited to one season. But the best part is the formula. It's completely opaque in one coat. One-coaters are pretty rare. This is extremely dense and pigmented, and if there ever was an orange worth $16, it's this one. Yellow Brick Road. This is a sunny yellow jelly. I know what you're thinking.... yellow jelly. That sounds like a disaster. I thought that at first, with images of freaky, stained looking yellow-tinted nails in my head. But, happily (and surprisingly), this polish works. It's fantastic. It's not as sheer as I thought it might be, but it's sheer enough to maintain that squishy, not-quite-opaque jelly depth without visible nail line. The end result is this bright, cheerful custard yellow creme that just makes you want to smile. This is only three coats and you can't see nail through it. Doesn't it look so happy? Like Marshmallow Peeps, or even better, real baby chicks with fluffy yellow feathers. The formula on these was perfect. Each was different but provided no difficulties in application. Girls Just Want To Have Fun and Yellow Brick Road are three coats, Lara's Theme and I Know What Boys Like are two. All were on the thick side but applied evenly without drips or bubbles. Good dry time, good wear time, zero complaints on the formula. These were not the plain cremes I thought they would be. The fun, vibrant color combined with the jelly finishes on some and the super creamy density of the others really keeps these from being ordinary. I'm impressed with the formula, the colors and, as always, with the gorgeous bottles. They really feel like a luxury polish. For $16 a piece, they better feel luxurious! These do. I'm impressed. 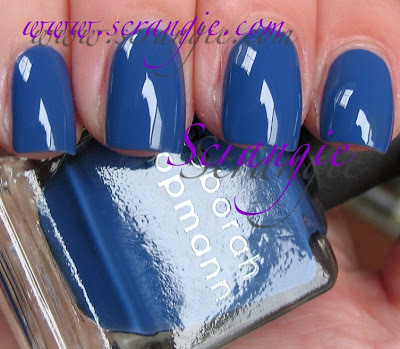 These are available now at all the various places that sell Deborah Lippmann / Lippmann Collection, or directly from Deborah's website. I do not believe any of these shades are limited edition; feel free to correct me if I'm wrong. Girls Just Want to Have Fun looks awesome! LOVE seeing the swatch of Laura's Theme. I had not bought it because I thought I had too many BRIGHT oranges that don't get used much...but now seeing it is darker than I though - I am going to think about it. LOVE THESE CREMES!...especially "Girls Just Wanna Have fun". Super cute! The blue and yellow ones interest me the most, although I think it's pretty awesome how the orange was a 1-coater! If only all polishes were 1-coaters! I Know What Boys Like is a beauty. Now the song will be stuck in my head!